Lake Macquarie Skips gives extremely high importance to the environment. This is why one of our objectives is to reduce the amount of waste that is being sent to landfills. We do this through a recovery program that promotes recycling and waste reduction. We assist in the redirection of waste materials that might otherwise be sent to landfills to other possible locations or uses. Waste disposal should be a last resort. We accomplish this by careful handling of the types of waste that go into Lake Make Macquarie skip bins. You can use Lake Macquarie skip bin sizes of 2m3, 3m3, 4m3, 6m3, 10m3, 20m3, 25m3, and 30m3 for this type of waste. This is only limited to garden wastes such as leaves, barks of trees, grass clippings, and other recyclable organic material. Lake Macquarie skip bin sizes of 2m3, 3m3, 4m3, 6m3, 10m3, 20m3, 25m3, and 30m3 can be used for this type of waste. This type of waste includes unclassified heavy materials like concrete, clay, big rocks, stones, soil, rubble, asphalt, sand, ceramic tiles, and bricks. Lake Macquarie skip bin sizes of 2m3, 3m3, 4m3, 6m3 and 10m3 can be used for this group of wastes. Miscellaneous waste is a mixture of green waste, general waste, and heavy waste. The amount of heavy waste should only be limited up to 50 percent of the load. Lake Macquarie skip bin sizes of 2m3, 3m3, 4m3, 6m3 and 10m3 can be used for miscellaneous wastes. Recyclable heavy materials must be clean and sorted. This group includes only wastes concrete, soil and bricks. 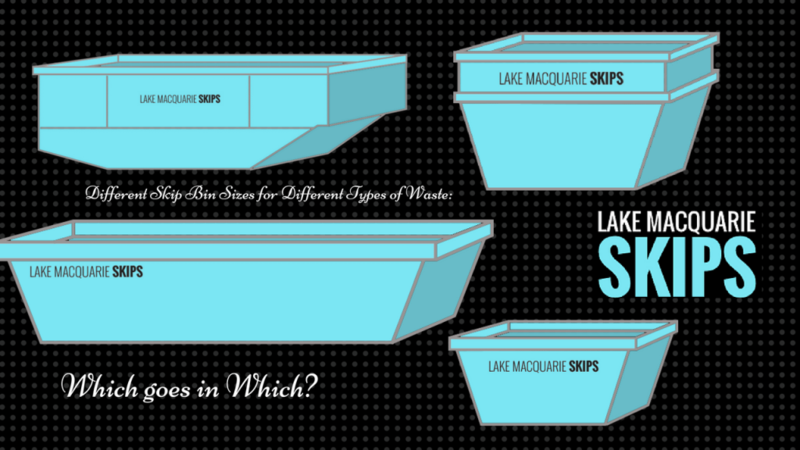 Lake Macquarie skip bins of sizes 2m3, 3m3, 4m3, 6m3, and 10m3 are available to be used for this group. Are you still at a loss as to what you will do with your wastes? Enlist the help of Lake Macquarie Skips for your waste disposal and rubbish removal tasks! We are a locally-owned company that has been operating in several parts of the country for 16 years. We pride ourselves in providing efficient delivery and pick up services, 6 days a week. Book our services by using our 24/7 online booking system. Our professional team will ensure that you will be attended to as soon as possible.